Thursday night we arrived from South Carolina into Ohio with high hopes of shooting a 200 class buck. Unfortunately, we brought the rain and lightning we had been having in South Carolina to Ohio. When we got to the cabin at base camp, we were warmly greeted by Dan and his staff. They brought us inside and made certain we felt like it was our home to have so we made ourselves comfortable. My brother in law and I took a tour of the lodge, looking at all of the pictures and various mounts that hung on the wall. Dan got us fed and settled in for the night, as the rain continued hard. The next day, the rain had not stopped and there was a front over us dropping a steady rain shower as we ate Ray’s well prepared breakfast. After drinking some coffee to wake up, Dan informed us of the game plan for Friday morning, and then we headed out. Riding across the terrain in a comfortable Polaris, we spotted numerous does out feeding in the fields which was a great sign the deer were moving in the rain. We road down into the hardwoods, and spotted more does actively feeding. The terrain was steep and beautiful, and it made it quite an adventure coasting down some of these slopes. After a brief ride, we wound up on a steep ridge that had a beautifully, well crafted shooting house that we sat in and prepared ourselves for the morning hunt. As we stayed warm drinking coffee, we spent the majority of the morning glassing for bucks. However, with the weather conditions picking up, wind included, nothing was moving. Dan was a pleasure to talk to during this time as he assured us something good would happen this afternoon. Boy was he right! At around lunch time, we decided to head back to the lodge, change, and head into town for an Amish meal. On the way out of the woods, we saw a massive 250″ buck stand up out of a thicket to watch us. We also came across to young 10 pointers that stopped only long enough to give us a glimpse. There were many does spotted on the way out too. This gave us some excitement as to what the ranch was holding, so we knew it was going to be good if we got a break in the weather. Dan took us to this wonderful Amish restaurant where we were able to fill up on some down to earth home cooking. We ran some errands while we were in town since the weather was bad (which gave us a great opportunity to see the Amish community), and then we headed back to the lodge. That afternoon Dan had taken a memory card to his office to see what bucks were hitting the feed in the field next to the cabin. Sure enough there were two bucks on the property, but were still coming back on late in the evenings to feed. These two bucks always traveled together, the question became, how do we ambush the bucks, where do we sit, and can we squeeze off two bullets at the same time. Dan used his intuition and willingness to think outside the box as to how we could pull of this feat. While Paul took it easy on the couch, I went outside and killed time shooting the target with my bow for practice. Meanwhile, Dan had fired up the bulldozer to clear shooting lanes up to the feeders. The growth was taller than all of us in that field, and the bulldozer was knocking it down quickly. Then Dan scouted around to see if he could set up of stands or ground blinds, which would not have worked. However, he did quickly see the old oil rigs in the back of the field and had us climb up on the rigs to see what kind of a shot we would have; the rigs were shielded by trees hanging over them which made for cover. It turned out to be the perfect spot. We went back in and ate Rays wonderful Burgers to give us some fuel before we headed out. After the three of us climbed to the top of the rigs, I sat flat on the ground to avoid the branches in front of me. Paul sat in a chair with a shooting stick, and Dan sat behind us with the camera, snack cakes, and bottled water, The first visitor to the feeder were a couple ground hogs, but we didn’t shoot them because we were there for those beautiful deer. Only one hour and thirty minutes of sitting Paul whispered, “Here they come.” We all three were being stared at on the approach, so we froze motionless for a few seconds, and then one decided to keep going. The other was still looking back. I used this time to get my rifle up on the deer, and Paul got his on the other deer after he turned. The plan was for a silent countdown so Paul whispered, “3, 2″ “Stop!” “Stop!” I whispered. Mine had just taken a step behind some branches. Dan assured us we could pull it off, “Paul you are on the right, Devon on the left.” “Okay” I said because my deer moved another two steps out from behind the branch. Paul started again silently, “three,” “two,” “one,” KABOOM!!! went one simultaneously loud shot from both guns. Both deer were hit, and turned back to run towards their bedding area. After slapping five to Dan for his ingenious plan, and ability to make things happen, we got down to go find the buck. Mine was found 20 yards away in thick stuff. However, PJ’s was nowhere to be found. After combing the tall grasses for hours and replaying the video, we were confident he was shot, and it was going to come down to the right decision. When we found blood at the section of the fence he jumped over, we trailed him up the ridge. He was laying there and jumped up and ran down into a thick bottom. We decided because it was getting dark to lay off him overnight. So Paul was forced to sleep with the agony of potentially not finding his deer. The next morning Dan sent out 5 people to join our efforts and in a matter of 30 min. Paul had found his dead buck in a thicket. What a hunt, I have never simultaneously shot a deer with someone, let alone, pull it off to sound like one shot. I had never seen a bulldozer used real quick to set up shooting lanes, and I had never sat on an old oil refinery to shoot a buck. All of this was concocted by Dan Yoder, and his drive to do some things differently so that he could help us accomplish our goals. He pulled this hunt off like I had never seen. Enjoy the video of it, because it was not scripted! We went back to South Carolina thoroughly impressed with the confidence that World Class Whitetails of Ohio had to get us those bucks. The plan was well thought out, the set up was outside the box thinking, and the whole hunt was innovative. Dan likes to be the best at everything he does, and now we know why. 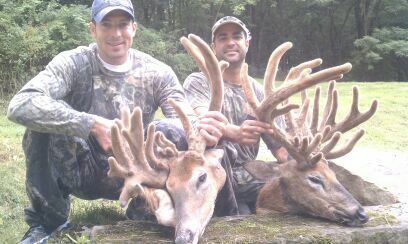 We definitely left World Class Whitetails with two huge bucks feeling like we had just hunted the top outfitter in Ohio. Special thanks to Dan, Ray, Dennis, Jess, and Reuben on a trip we will never forget. God bless you all. Devon and Paul.